No one’s knocking St. Moritz, Gstaad, Zermatt, or Saas-Fee. Hey, if you’re looking for spectacular, pricey, high-mountain skiing and huge, international apres-ski parties, these are your go-to places. The problem is that they’ve become everyone’s go-to places, and the lift lines can be long, the ski runs crowded, the tab hefty, and the parties so loud and boozy you may not want to get out of bed the next morning. But it doesn’t have to be that way if you want to ski the spectacular mountains of Switzerland. You could do like the Swiss do, and go for the equally spectacular, but far less crowded, resorts known to the locals but not many foreigners. The Swiss go where there are few or even no lines, the ski runs are wide open, the prices are reasonable, and the parties are often fueled by delicious, first-rate local wines. The advantage of having one of the world’s most scenic landscapes on their doorstep is not lost on a people whose wealth allows them to travel a lot. So the Swiss ski in Switzerland. You needn’t know the local language to enjoy these five terrific places; many of those whom you meet will be able to communicate in basic English. But don’t expect to eavesdrop: Most will be speaking Swiss-German, a particularly tough (for non-natives) dialect of German. Some resorts are in the French-speaking area of Switzerland, and some in the zone that speaks Romansch, the Romance language spoken in some cantons that sounds very much like a dialect from Northern Italy. Braunwald, in the northeastern canton of Glarus, is a well-kept Swiss secret. The village of three hundred inhabitants is a little less than two hours by direct train from the main station in downtown Zurich, and then up a funicular to the top of a mountain. 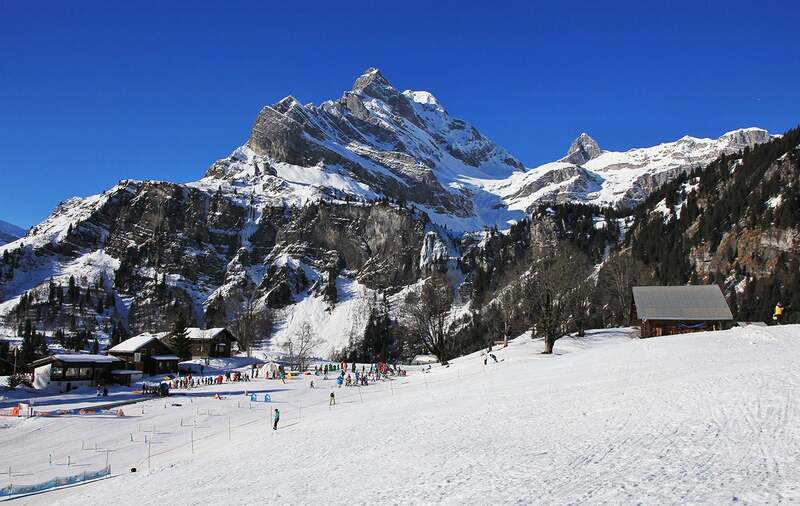 With nearly a dozen ski slopes, as well as trails for snowshoeing and cross-country skiers, Braunwald is the perfect place for both expert skiers as well as people traveling with families. There are a handful of very old-fashioned hotels, lots of apartment or house rentals (for under $1,000 per week, plus taxes and linens and cleaning fees, you can get a two-bedroom condo). No cars, one bakery, a tiny grocery store, and a literary cafe called BSINTI where Swiss writers and intellectuals often drop by. Scuol, in the canton of Graubünden in southeastern Switzerland, is another place that’s ideal for families as well as serious skiers. Bordering Switzerland’s one national park, here you find about a dozen runs, some that are easy and a few that require real skill. The village is in the Romansch-speaking part of the country, with regional specialties in restaurants. If you’re renting and have a kitchen, you can get amazing meat (especially lamb) at this tiny, upscale butcher shop on the main drag. The thing I love most about Scuol, beside its beautiful architecture, are its famous natural hot spring baths that include a “Roman-Irish” experience of steam rooms and little pools as well as a clothing optional sauna-land. 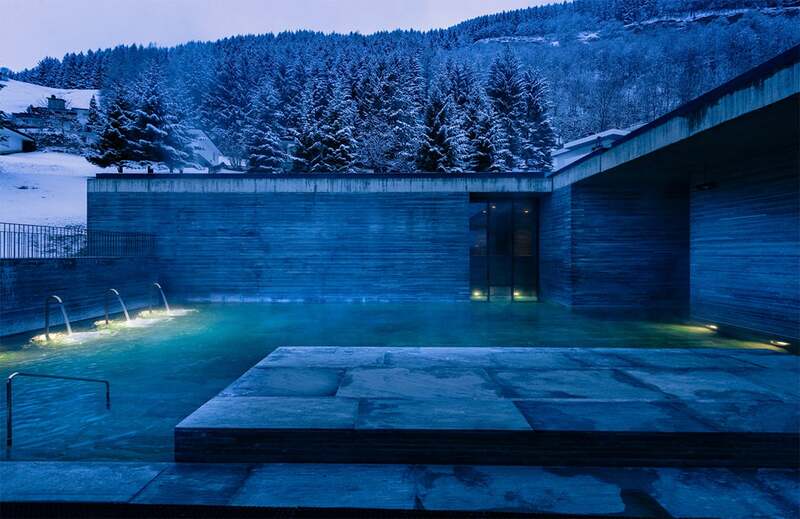 Speaking of hot springs baths: Vals, also in the canton of Graubünden, has the Therme, a world famous architectural gem designed by the Pritzker Prize-winning Peter Zumthor. There are fewer runs in Vals compared to several other villages, but each one is nonpareil. And after a day of skiing, few experiences compare to soaking in the stunning baths made of local stone at the Therme. Note: A couple of years ago the baths, owned by the community, were privatized and are now known as Vals Therme 7132. Nothing has changed structurally about these baths, but it’s a bit costlier than before with the “bonus” that there are fewer people in them and much more privacy than before. Arosa, situated near Chur and Davos, is another favorite of the Swiss. Like Vals, it’s perfect for couples and other grown-ups. Altitude is over 5,000 feet, views are stunning, and while it can be costlier, since it’s fancier, than time spent at Braunwald or Scuol, there will be fewer people. Finally, have a look at Flims. There’s simply no place more beautiful. The village has been popular with skiers since the 1870s, and nowadays it maintains a charming, old school atmosphere. 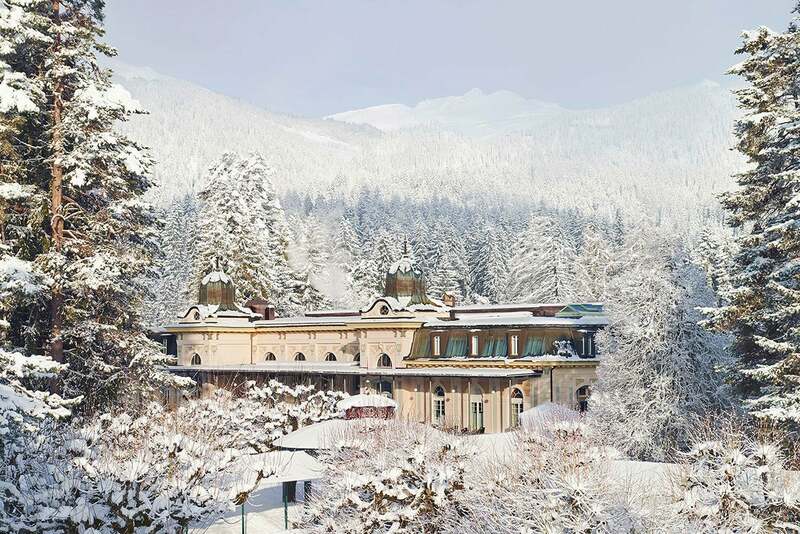 Lots of slopes and places to shop and dine, and home to one of Europe’s most famous and iconic hotels: The Belle Epoque masterpiece known as Waldhaus Flims. If you’re on a budget, there are about 30 other properties in the village as well as apartment rentals, and you can cook at home and save your money for lift tickets. Speaking of lifts, each of the villages noted offers tickets by the day, week, or season. With some places, you can buy the tickets online. The villages have Luftseilbahns (big carriers), gondola (for four), chairs, and T-bars. You can check the country’s entire list of lift prices. Another hint on how to enjoy skiing in Switzerland without the crowds: School holidays are staggered so that the kids aren’t on the slopes all at the same time (except for Christmas). Go to the Swiss site for school holidays and plan accordingly. The Swiss take their skiing seriously, of course, but they also love après-ski. Every village has Stubli, or pubs, where locals hang out and enjoy fondue, raclette, and great wines. Or, if you prefer, the Swiss rail system has an après-ski “bartender” on one of its trains.